Influencer marketing kits can be used a few different ways. The traditional–well, as traditional as it gets in this age of flash-in-the-pan marketing strategies–mode is to send kits to targeted individuals. Research goes into identifying influencers in your market. Time goes into building a relationship with them. And finally, the money and effort put toward creating a custom, individualized influencer kit all adds up to quite the process. The return on investment for influencer marketing can be tremendous. It’s a worthwhile investment for your company. But there’s another mode for influencer marketing that taps the market a little differently, and that’s to take a more mass marketing approach. Research and develop an influencer kit that can be sold as a retail piece. 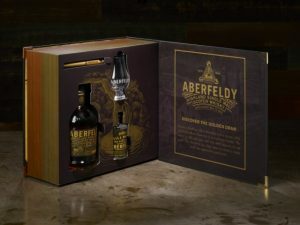 It can include many of the same elements, like premium packaging and accompanying collateral, but without the exclusivity. Mass marketing runs the risk of being less targeted, but it can reap huge rewards as well. The first question that might pop into your head is Who else is doing this? As you can see from the image to the side, liquor is one industry that has employed this kind of brand-building for ages. These kinds of launch kits can double as influencer kits–if you start to tie your messaging to your brand in a way that positions customers as brand ambassadors. Liquor has long employed a kind of pyramid-shaped flow for their customers. Companies have products in the same category ranging from the low end to the high end. The customer journey usually brings them using the low end products, and once the customer builds an appreciation for the product, they’re willing to champion it and ramp up to the next level. Ultimately, they’re invested in the product to the point of purchasing the special kits. Flasks or glasses imprinted with the product’s brand or some other catchy slogan. One example I saw was a liqueur that came with one lowball glass and a line in the middle. On top of the line, it said Optimist. Below it? Pessimist. It appealed to a wide range of people. And the best part? To have a matching set, people were willing to buy 2. Use this tool to increase sales as well as influence customers to showcase your product. Printed collateral, like recipe books, histories of the product, or other kinds of supporting information. These work well to upsell other products or to share out interesting facts that customers can then share out as well. Premium packaging to hold all of these things together, as well as create a stage for the product itself. Customers love keepsake items for the brands they champion. Invest in feature like embossed typograhy and high quality graphics. Use tactile and and visual elements to appeal to their senses, and enhance the product itself. Turned edge boxes are ideal for influencer marketing kits, and adding premium elements like magnets, custom trays and other features for enhancement. Your company might call them product launch kits. Sales kits. Welcome kits. Whatever they might be, but their aim is the same: to develop brand loyalty and influence sales positively. That’s the heart of influencer marketing. It’s about reaching the people with whom your product resonates, and giving them a reason to champion it further.